This design-build project consisted of a new 6-story, 225,000 square foot Administration Building located in downtown Stockton for San Joaquin County. The Crosby Group provided structural engineering design services for this unique landmark structure, utilizing a buckling restrained-braced frame for the lateral resisting system, and a steel frame with composite metal decking for the gravity system. The project is a design-build partnership with Fentress Bradburn Architects and Hensel Phelps Construction. The design was undertaken during a period of rapidly rising material costs. Therefore, a key team challenge for this project was to minimize the impact due to rapidly escalating steel costs while maintaining the aggressive construction schedule. Through early team planning and our fast-track design, the design team was able to finalize the building design that allowed the contractor to be able to pre-order a majority the structural steel, thus ensuring stable steel pricing, and thus expedite the design and construction schedule. 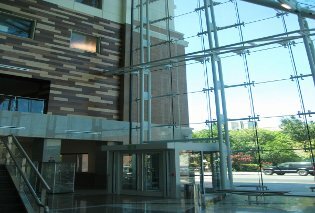 One of the design challenges was to develop a three-dimensional truss system that allowed for the support of a cantilevered ‘floating floor’ at the 6th floor over the main entry lobby, providing the space for the County Council Chambers. Another exciting challenge was the support systems for the complex atrium glass structure. The glass structural system was supported and braced in multiple locations to facilitate the faceted look of the atrium and involved complex steel detailing and coordination. PV panels were installed at the roof with ballasted connections so as not to penetrate the roofing membrane.